Well I’ve been thinking a lot lately about what’s blooming and sprouting these upcoming summer months. I think berries, stone fruit and melons when I think of warm weather. So as usual, where do I go?! Berkeley Bowl and Rainbow Grocery! These two places have such an eclectic selection of fresh and dried fruits, it’s like a healthy candy store…..but without the candy. First up I had to get some peaches and plums, but I bought dehydrated fruit (not the best idea now that I look back, I’ll explain later). I wanted to make a seasonal infusion with gin. Since Gin has such wonderful botanicals ranging from citrus peels, pepper, cinnamon, coriander and of course juniper, I wanted to see what stone fruit could bring to the table. I took a bottle of American Gin by Bluecoat (750ml) and combined it with 16 oz dried Yellow peaches and 8 oz dried plums. I let it sit for 3 days and then strained it all out. I must say that the infusion came along quite fast. Maybe it’s due to all the sugar left in the fruit, but the dried fruit also sucked up almost half of the gin which is why I’ll probably use fresh fruit next time. I ended up putting the dried fruit in a large bowl covered with Saran wrap and let it sit in the sun. This got me about 1/4 of a bottle of gin back. I’ll have to mess around with some cocktails at home later or back at Chow….if they want to keep up their cocktail program (which is tanking right now since I left). Next I started to work on a reduction for possibly two or three cocktails. One being a beer cocktail and the other a Pisco cocktail for an upcoming competition. 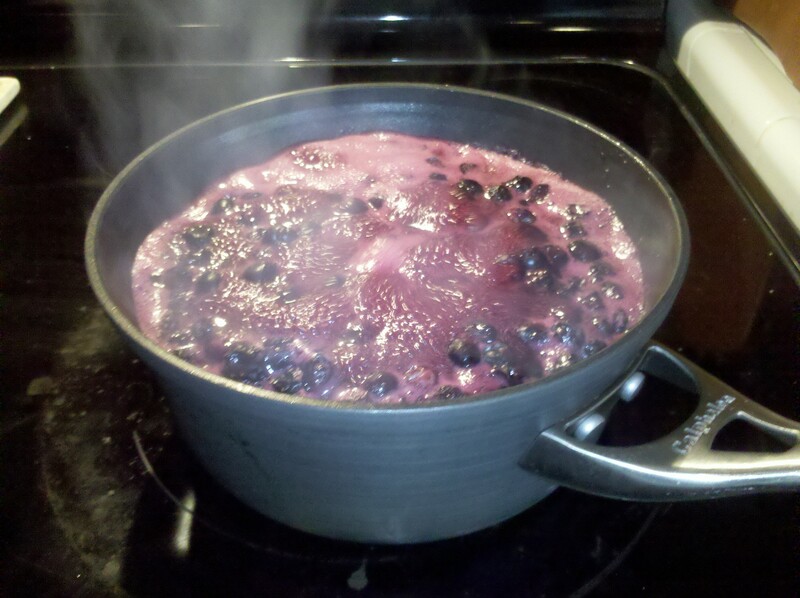 I bought 2 containers of fresh blueberries weighing in at about 1.5 lbs. I tossed it all in a large stove pan (non-stick of course), added 1.5 cups of white cane sugar and then added 1 cup of Chamomile tea. 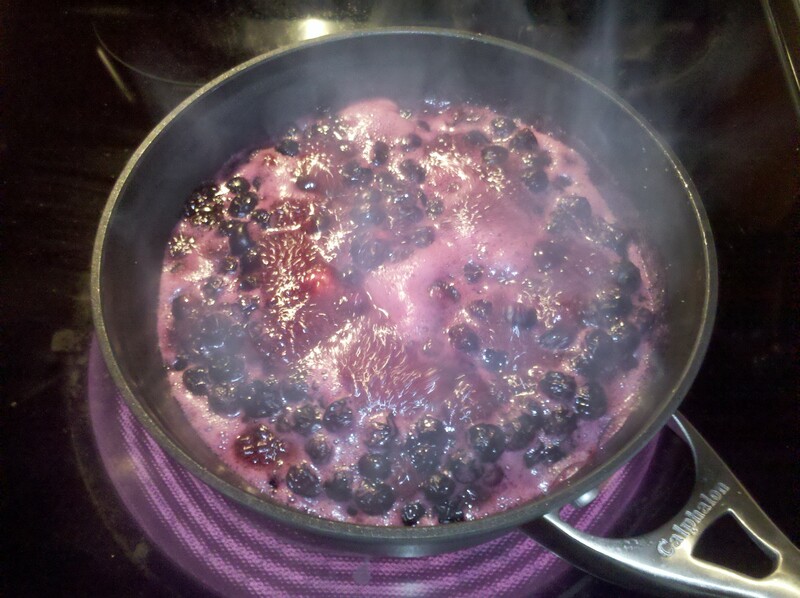 After I drained the tea, I took the left overs from the tea (which I made in a French Press) and added it to the blueberry reduction. Definitely keep tasting it as you go, if you don’t the tea remnants can bring bitterness to your reduction and ruin it. I plan on using the reduction with Pisco in one cocktail and a dark Barbados Rum and Hefenweizen for the other. Don’t let the reduction cool too much when you’re done with it, because this will make it harder to strain out and bottle. If you have it, use a large mesh strainer, it’ll definitely make it easier to squeeze everything out! I saved mine in a mason jar in the fridge. It should keep for a few weeks, but it’s tasty in cocktails, but also on food like ice cream or yogurt! Cheers! ~ by myamericandram on June 25, 2011.